Happy October! I'm celebrating my favorite month by sharing a quilt block with you for the first time in a looooooooong time. I'm this month's queen bee for the Columbus Modern Quilters, and I selected the Arrowhead block as my block of the month. This is a traditional quilt block, pieced in a very simple way – my sample block took about 10 minutes to make, and I was pausing for photos. For those of you in the bee, please choose a light and a dark fabric. As you can see from my block, bright and bold are my thing – just make sure there is some contrast. Please stay away from low volume or solid fabric. Place two 10” squares right sides together. Begin sewing 3” down from the top right edge. When you're 1/4” from the edge, pivot and stitch to the bottom left edge, backstitching at the end. Rotate the block 180° and repeat for the last two sides. Cut the unit diagonally, through the sewn corners. You will have two triangle units. Stack the two triangle units with the opening in the bottom left corner. Measure 3” from the left and cut through both units. Now measure 3” from the bottom and cut through both units. Open all of the sewn units and press the seams toward the light fabric. (This will help everything nest together nicely when sewn.) Lay out the pieces as shown. Sew the pieces together in three units as shown. 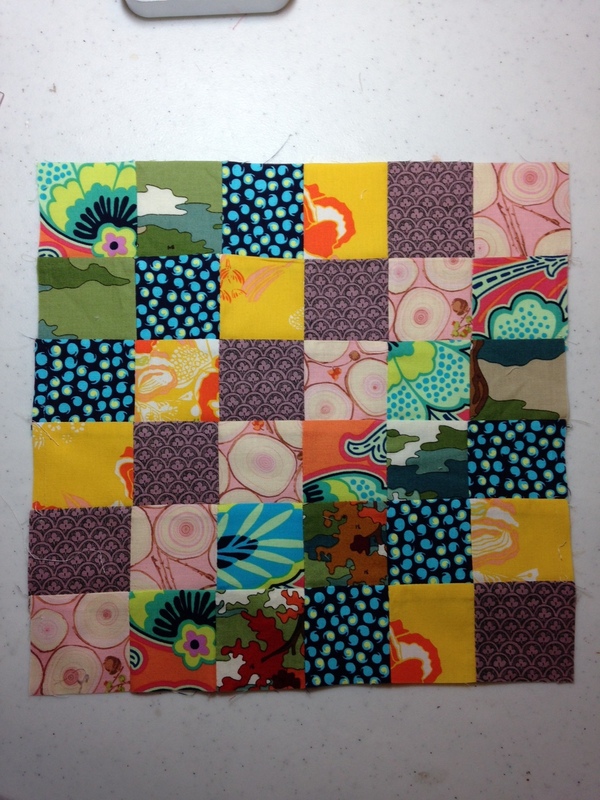 Then sew the three units together to make the block. Square up and trim the block to 11.5”. Congratulate yourself on a job well done!